İpek: First of all, we would like to start with a general question. For almost all of your works, we can say that photographs comply with the energy of the physical field, and perhaps even submits to it. Therefore, the first step should be trying to find out what is the position of you in your photography. Although the question is a little bit cliché, is it possible for you to further tell your perception of photography? 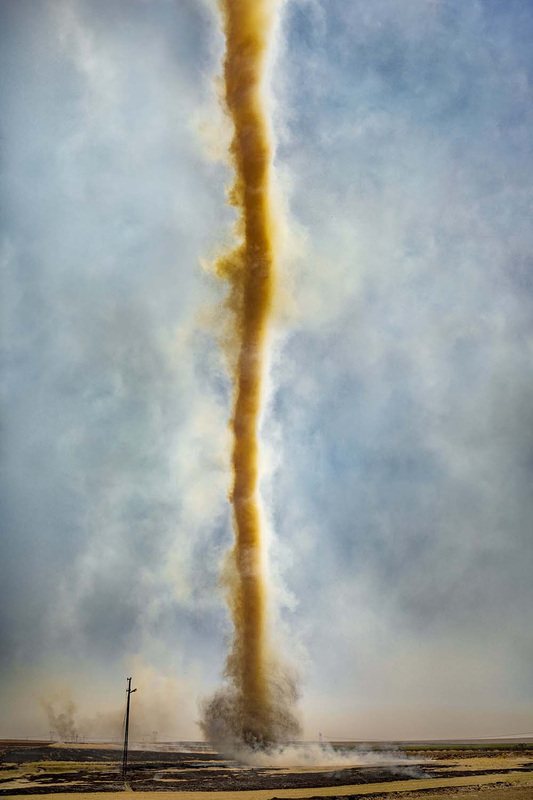 Where does the photography end and where does the physical space/ installation begin? Dams over the Euphrates have led to inequality in water distribution among Syria, Iraq, and Turkey, and the senseless use of water and soil in Urfa caused desertification in the regions beyond the southern border of Turkey. The sudden and extreme enrichment that came with the dam at the side of Urfa, the changes that are characterized as economic development are transforming the over-irrigated and overcultivated plains with sandstorms that now and then comes from the desertified regions of the Middle East that are condemned to drought, and remind us that nature is a whole without borders. Mert: Then, is the position of photography in your current production practices as same as that time? How did this improve? S: It is not. My relationship with photography always transforms. For example, during the early periods of my production, I was very impressed by the Dada Movement. The Dada Movement represented very well that how photography unsettled the art world. In painting class, we were making collages first, and then we were painting based on those collages. My relationship with photography also improved with those transmissions and intransmissions between different mediums. Moreover, the points of contact between the people from different art mediums are very limited and they seem to be separate from each other. Photography at one hand creates the transformation of the concept of image and collective memory, the analysis of the eye and vision, the measurability of the subject, the emergence of mass culture, development of reproduction systems, institutionalization such as the transformation of the concept of the museum. On the other hand, we are talking about an effect that has existed since it was invented as it is the resource of the development of avant-garde art practices against the same systems. Ş: This is definitely a problem. It is like as if we live in a community that is saying; "We are photographers"; the painters are in a separate position, authors and illustrators are in separate positions, and none of them are taking care of each other so that a productive contemporary art could be formed. Although we seem very crowded, everyone is retiring into his/her own shell. It will certainly be helpful to break this chain and strengthen bonds. S: Our purpose of making Tekrar ∞ Döngü was this in a way, too. On the other hand, there were topics such as the cycle of life, the concept of repetition, and etc. As I was preoccupied with thinking over the cycle of nature, I thought "If I organize talks about it, I could go deeper and make contacts with people from different fields." The idea first appeared like this. An author could come up and say, "I have never listened to a sound performance before", or another person from a different field had to listen to a scientist having a speech about the stars and the cycle of life. So, there was a collaboration. Of course, I do not mean to say "I should combine all the mediums" as a mission, but my mind works a bit like that. For example, last night while researching for my new project, I found myself to be absorbed in the articles about Newton's physics and said, "How did I get here?" M: During your interview along with Merve after Rutubet, there was a question about the photo shootings in Urfa. Since you are familiar with Urfa, you have called the photo shoots as "re-looking". Unlike regular traveling, it gives you a new perspective. S: Yes, in fact, this makes me turn back to the first question that you asked. Photography brings you the opportunity to discover when you are shooting. Photography has a characteristic which is able to direct all of my projects. I wandered around with a camera, looking with the aim; "What is the feeling that I get from visiting Urfa?" After that, a feeling emerges and I realize what I should do. If the first idea becomes limited by photography, I can decide to shoot a video. I think photography is more like a guide in this sense. M: In Rutubet too, you have approached to subject with photography, but later it turned into an installation. Your beginning point there was the photography too, actually. Ş: It's a guide, as far as I can understand. It is a gathering of mediums that grow, develop and diversify. You are also open minded in that matter. S: Actually, the word "guide" puts the photography in the center again. Sometimes I can start by reading about my subject too, but this works as a direction of thinking processes rather than searching for a way. Photography is not very central, but rather it is something that I have practiced for a long time. It is not easy to go somewhere and say "Here I am! ", but when I go with a camera with my hand, people say "Oh, she came to take pictures". Therefore, it turns into a tool that makes easier to create relations. As a result; I can say that the camera is a useful instrument that I sometimes use to understand, explore or look at a subject better, deeper. M: In your works, you also include the photographs of the process and the before/ after pictures of the installation. For example, stop-motion videos of the process of Rutubet or the process-driven way of thinking in Sürgün. This has a different meaning to you other than just archiving; the work of archiving becomes the work itself. Where do these limits start and end? S: Actually, this is a matter of temporality. The photography can show what we cannot perceive and can turn it into a state that we can perceive. What interests me is this form of seeing, the ability to show the invisible and the tension created by them. As I mentioned earlier, it is similar to the fact that; with the foundation of the museums in the 19th century, photography turned upside-down the history of art. Think about this, it is a medium that brings together the events we have never seen together in a chronological order! It is something that never happened before. What excites me here is the fact that photography reproduces the time, it reproduces our perception of history. In this connection, it reproduces the microorganisms which are invisible to the naked eye, in Rutubet. For this reason, it is not the documentation feature of photography that attracted me, but it is the tension that it creates. Moreover, the camera is recreating the sense of time. There is striving beyond the characteristics of documentation. In particular, Sürgün and Rutubet were the projects that were directed by photography. 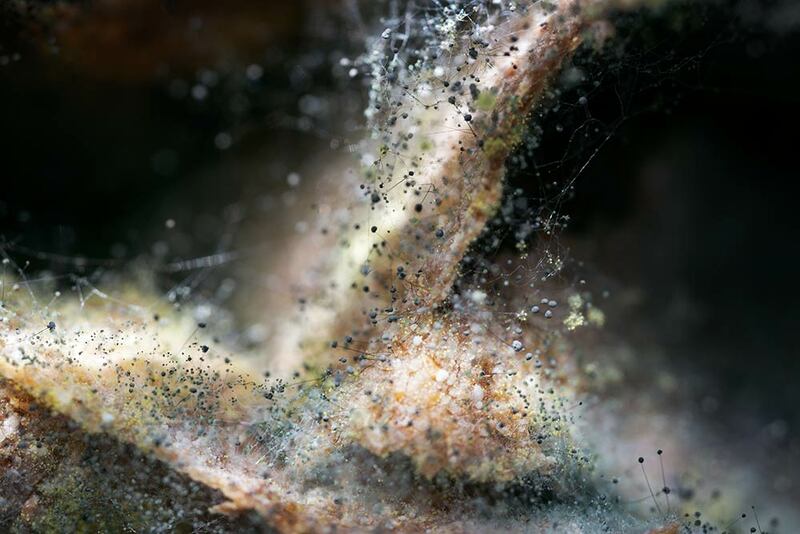 "RUTUBET", is composed of Sinem Dişli's photographs and site-specific work, in which she examines micro-scale organisms formed by conditions such as heat and humidity inherent to TOZ's basement. Approaching this urban building as a breathing and living structure, Dişli investigates, by experimental means, whether creating an alternative habitat is possible through observation and intervention to the ratio of substances such as water trapped in a division where airflow is limited. M: I think this is really distinguishable in Sürgün. Someone who does not know that Rutubet is an installation cannot fully imagine the boundaries of your work when s/he sees only the book. But for you, they both seem to be the same, in means of significance. S: First, let me explain how Sürgün emerged. I was accepted into a residency program in New York. They put me in a very isolated place as they've thought I could control the light more easily because I took videos and photographs. It was an incredibly beautiful studio, but it had no windows. I've felt very claustrophobic there. That's why I started getting plants. I could not produce anything even though residency was very important for me; then I said to myself, "As an artist, I must get over this, I must find a way to transform this disadvantage into an advantage." I needed a way to express that feeling rather than thinking "Should I take pictures or create a story with videos?" One night I stayed up late, I said to myself that, "OK, I am going to grow beans in the bed." This idea emerged as a result of the question; "Can I transfer the cycle of nature into this industrial city system?" My aim was to underline the contrast. 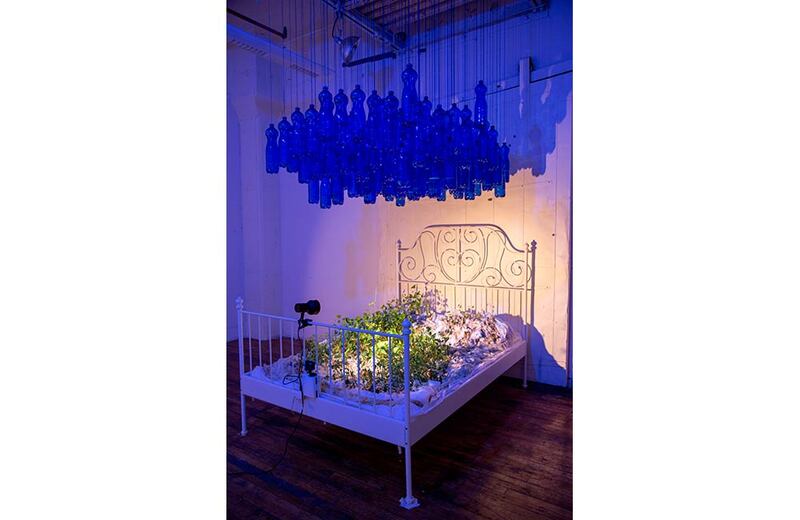 Beyond plant growth, a domestic element was needed to represent the interior. I think that the element was a bed for me. At that time, I was also thinking about topics such as cotton fields, the over-consumption of water, the cost of the need for organic production for a healthy life, and etc. On the one hand, I was growing beans, and on the other hand, I was photographing them every minute. Of course, the making of the installation somewhat was shaped by thinking on how to use the possibilities offered by the camera. These two are so in each other, I cannot distinguish them. 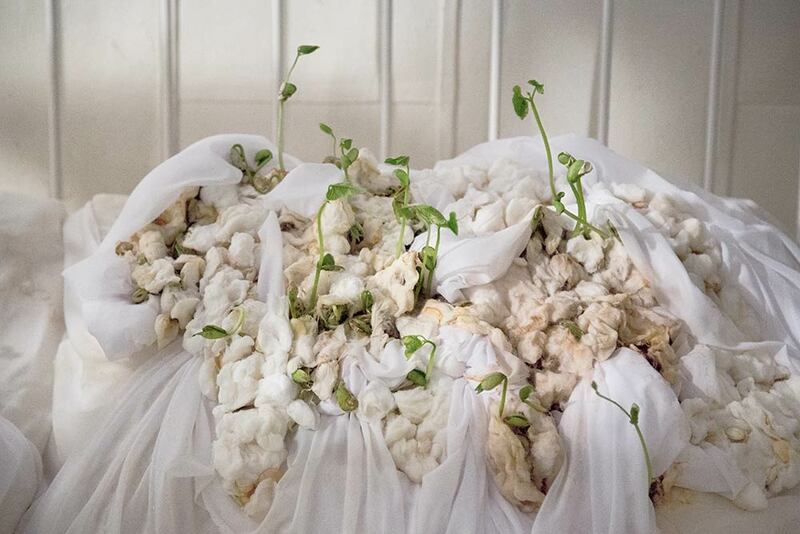 This bean-cotton project really emerged at the end of a one-month laboratory work. How many holes can you make in those bottles? It is not enough to make one hole for the drip, you should slit the bottle. I have made preparations for two months, but I set them up and photographed in 15 days, and in this process, my studio was open to the public. Every single thing gives birth to another in this process. We can partially perceive the dynamics of plants with our bodies, our limbs; but the camera makes it visible what kind of energy is circulating around another living creature and the cycle of nature. Ş: In daily life, we do not realize how the plants grow. Point this out, means something different. 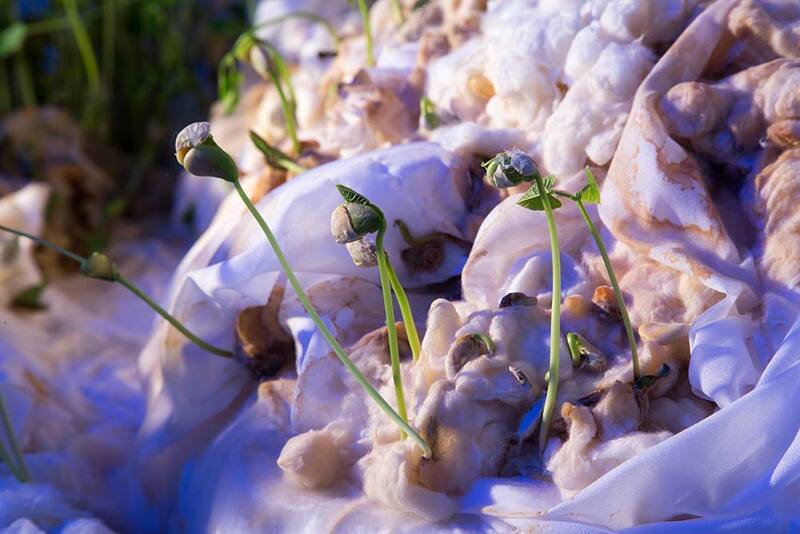 Also what strikes me is that the fact that they grow in the cotton, and the artificiality that seems natural. S: Thanks! Yes, it is a work that I like very much, too. You assume this work as a breaking point, but I think it is Sürgün. M: The breaking point is after Hare, I think. The cases that you use different materials were increasing, as well as the fact that there was a cycle. Moreover, Rutubet, Sürgün, and Hare were turned into a book. We started to see this commonality more after Hare. Ş: Due to the fact that both the existence of the cycle and the use of material and medium is more layered and intertwined. S: Actually, yes it is. But on the other hand, there was also a reversing process. I am going to skip a little, but first I should talk about Cereyan. I was working on the Euphrates River, and my work was starting to improve. At that point, I knew that I would not just take pictures. In Urfa, the soil was getting salted because of overwatering, and salt was necessary both for life and it began to exist in a corruptive dose. I had some question in my mind like "whether I could concentrate on salt or not?" etc. At that time, in the orphanage where I was invited for Fotoistanbul, I chose a room having rounded forms on the top floor. One week later, the team called me and asked: "It's raining and the flood ruined the place, can you choose another room?" I started thinking, "Can I make a work that embraces leaky water?" With the running water, I decided to create a transformation in that room. I used photographs, I withered them, but it was not possible to do this only with photographs. Actually, I did not photograph that particular production process either. I did not want to frame and exhibit my photographs in classical form. There is an irony there, the team invited me as a photographer, but my practice of producing work is like this and I wanted to show it. I focus on the water and its effects on the cycle of life and the relationship of it with the city structures. Of course there is a breaking point in this story, but on the other hand, there were lots of works of mine that I do not show even if they had been exhibited before. In fact, the breaking point that you mentioned was something that was going on in a hidden way. That is why I set up this studio. Recently, I have a desire to know and mingle with materials and to shut my self off in a place with the purpose of working on something by touching it. M: On the other hand, Rutubet, Sürgün, and Hare were soon turned into a book. How do these three projects establish a commonality for you? S: Actually, you also know the process very closely; we wanted to invite artists to TOZ Art Space and them to try creating something in two weeks. Even if a product did not come out, it did not matter. We thought that we should participate in it, too. So, I directly decided to work on a component that causes a lot of trouble to us in any given place: Moisture! Everywhere smelled like damp (Rutubet) and I wondered what would happen if I took pictures of it. I could not believe what I photographed with a microscope that day too. The building was transformed by fungi. The most basic thing that provides the transformation in nature is fungi. That idea was amazing for me. The formation of this work counseled me to combine these three works which all include a type of transformation. The issue of production has begun to make me very tired though because it needs huge budgets, spending a long time with space and it needs other professional support. I prefer to retire a little bit instead of pressure myself with exhaustion. It makes me more excited to simplify and produce work through one idea. Thinking about the space, trying to build a structure, learning another material each time, touching the spirit of that material obviously tired me. Every piece of material force you to learn it from the beginning. So, I want to work with the same material for a while. M: Especially after Rutubet, you were very clear on this subject. S: Yes. Now I am working on a project that makes me so excited, makes me climb up the walls. I am going to Urfa at least two times a year for about 7-8 years and taking photographs there. When you do something repeatedly, in a cycle, something else emerges at the end. I am very excited about this; the shootings that I have been done for so many years, the projects that I have been produced come together in such a way… There is Göbeklitepe district, remnants of Mesopotamian Civilizations, and etc. When I think about those remnants, history, how we interpret history, how industrialism destroys the nature; there emerges something very exciting which makes me very satisfied. My new work is about this. This simplification will be very good for me. M: Maybe we can talk about Cereyan at this point. It seems to me that we left it a little behind. S: Yes. In fact, it is the most important project of mine. When I was a kid, there were pomegranate gardens in Urfa. Urfa was famous with its pomegranates in those days. One day during my visit to Urfa, my dad took me somewhere and asked, "Did you remember this place?" I was taking laconic photographs with my Hasselblad. There was nothing but concrete. Then I saw a pomegranate sculpture and realized that all the pomegranate gardens had been destroyed but the statue that represents them. How can we destroy nature, how can we get rid of it, and we can erect a sculpture of the most concentrated thing that nature has given us? I have started to question the cause of this transformation. I realized that the beginning point was the GAP Project. In fact, I started to think about the barrage built on Euphrates River which provides all this economic development in the area and how this is related to the war in Syria, and also the issue of drought. I realized that the cycle of nature is represented by the water in my works. Moreover, I found the cassettes of my grandfather. There were poems written in this subject: "Harran Plain will become a sea one day and the lights on Harran will turn into the light of the ships". An incredible dream. We imagine something, set up fantasy, and our intervention in nature during this formation… Yes, there is enrichment; but during this enrichment, what is it that you are emptying, what is it that you are destroying, it is like looking into this issue. I want to be an observer rather than creating a didactic reading. Of course, when I started to look at the whole history of Mesopotamia, things started to get mixed up. For now, the place that I am most focused on is the Temple of Sogmatar, because it is like an oasis in the middle of the desert. It is a living village without concrete construction, but 2500 years ago, it was one of the centers of pagan culture. For example, people were worshiping the Moon there while the people of Harran were worshipping the Sun. I cannot explain it clearly, but that place represents something about what I am doing. The underground water is too congested, but also they had a magical place that they observed the stars. I love this work, where the photography is re-introduced to make long exposures. I want to focus on this for a while. The link between temporality and nature-history-civilization. This installation reflects the power of water to give life as much as its menacing aspect. It was created under the influence of the vanishing of many villages and Mesopotamian remains that are submerged under the waters of the Euphrates as a result of its path being modified by humans, and of the recently increasing water-migration relation. The confinement, containment and the halting of the cyclical fluidity of water and its gradual transformation into an artificial lake have increased its surface area and this has caused evaporation and taken away the most natural right of creatures struggling with drought, living at the regions beyond the border even though the river runs there. Water is, in a sense, being released into air. This installation is an expression of our near suffocation, of our despair, and the despair of those who are being displaced for the control of water and oil, the main cause of war in the region. Ş: When we talked with Mert, he said that: "Sinem has certain routines every year and they are all planned." It seems like this studio will be a part of this routine. I think making this whole production process and studio a part of your life is a routine which also cannot be defined exactly like a routine. Is this the part that feeds you? S: Actually, what we are not capable of is what shapes us, a little bit. What I cannot do is focusing on one subject. My way of thinking is very complicated and I am excitable. All of these tires very easily sometimes. I have a need to ease this excitement and balance this energy. One of them is the need for the ability to focus on only one subject. I have recently discovered a book about how artists live their daily life and how they manage to organize the production process. For instance, it is written that Susan Sontag had never talked with anyone until noon and never answered her phone. She had just focused on writing until 1 pm; after that, she had started to get social and develop human relationships. Or Frank Lloyd Wright, the architect of Guggenheim had worked between 4-6 am. Victor Hugo had got his showers on a terrace in the afternoon with a horsehair glove, then he had started to work. Beethoven always drank coffee like he cannot work without it. The book emphasizes that: there is no such thing as "genius", but there is "routine". And I thought that "In this case, what I cannot do is stick to a routine". After a while, the studio starts to feel like you are rambling in your own mind, in your soul. This is the part that excites me the most. Every time I come here, I create a new relationship with the same material, with the same place, because I always change. It would become much more complicated if I would spend this transformation with other different hours, different days, and different materials. It makes me peaceful to come here every day and do something. I always think that: "There exist two versions of myself. One of them is me, and the other one that handles me." There is something that we can not figure out. We have hormones, we have characters; we have factors making us, we have an environment. We have the unconsciousness. Sometimes, instead of controlling them, we should create a routine to find a way. It is not possible to solve everything, but at least it gets more clear. Ş: Humankind is constantly looking for something new. But when you look at a place, if the things in this place seem new to you or if you are investigating the details, there is no problem. You can even think over a table, you can talk about it. I guess a lot of people are self-limited. If you can overcome it, even the routine becomes a positive thing. S: Yes, the routine you create and an imposed routine are actually two different things. Anish Kapoor states that artists are looking for something unreachable and get lost in it. But the ability to continue against the constant misery of going to the studio every day to create something new brings out something spontaneously. It actually exists a little bit in all of us; we hardly figure out where we should start or what we should focus on… Of course, there is the effect of our fragmented/ broken lives today, but the routine gives you the power to do something despite that effect. It is also about discovering yourself. For example, my mind is clear most after drinking my morning coffee. It sounds a little bit selfish but I want to spare that time to myself. This is the time that I stay by myself, being alone, reading something, do not allow someone to interrupt me. Ş: On the other hand, you are involved with many collectives and occasions. What do you think, does it fuel you? S: Actually, I prefer to produce work individually, but the collective means coming together, being in a dialogue, uniting the disconnection between different mediums through interaction. For example, in New York City, the space that I ran seems like curatorial work, but it was based on the artists' suggestions. Thus, a community was established. I suggested someone, that person suggested another, and as a result of this, there arose a collective spirit. For me, these things do not proceed by saying "Let's make a collective!" The foundation of HER HAL was after the closing of TOZ with the question of "Now, what will happen to all the projects that I planned?" We don't even know what to do now, we don't have a mission/ vision. We are constantly talking about what these, and this will be shaped by our needs and atmosphere we are in, along the way. Ş: I think you involved in projects according to your needs, instead of your projects. S: Community is a keyword, I think it is important. Because again, the routine is connected with this. For example, when we make a book, we talk with the same people, in the end, you become so familiar with your work that you feel a distance. When a new person sees that work, I cannot get that distance in terms of the first impression. I become obliged to tell more about my work constantly. Therefore, I think sustainability is very important. Talking about different subjects with the same people, even talking about the same subjects with the same people. We have a reading group in HER HAL. Nowadays, we still want to work on Repetition ∞ Cycle and we are reading a book called Ritimanaliz. I think deeper ideas emerge by talking with the same people. M: This seems similar to the purpose of Repetition ∞ Cycle. The collective also creates a status of a discussion of the same issue with different perspectives. The investigation of it over and over again. I think there are similarities in approach to what you do with collectives. S: Actually, whatever I do, there is an approach for looking holistically. "Everything is interdependent and interrelated to each other." Everything is intertwined and interconnected. The slightest energy you receive has an effect. That is why I retraced Newton yesterday. You are doing something and it has a cause and an effect. This is how it works in nature too. In Repetition ∞ Cycle presentations, we have talked about the memory and cycle, for example. We have talked about the concept of Nietzsche's eternal return. It finds its way by itself. Of course, we wanted to put together a lot of mediums with Rana. It emerged with a desire to make a discovery about the transformative power of repetitions and cycles in life. In the presentations, examining and incorporating of temporal and spatial perception in the repetitive order of all cyclic movements in the universe has an important place as well as the physical rhythms such as heartbeat, breathing, and sleep. There was also a yoga performance, for example. We didn't want to limit presentations only with art and we did want to go towards the relationship of it with our body. And one of the most important thing in Repetition ∞ Cycle was how a person is defined, where these definitions put someone and how it works in the public sphere. This was very important because we asked a photographer, for example, to make music. We had this knowledge but people did not know. It is something good for that person, too. M: There were some ideas for connecting some people in the presentations. Therefore, not only the audience but also the person performing the presentation/ performance was facing a different and new experience.